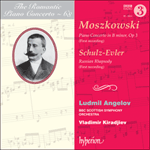 When Hyperion launched the Romantic Piano Concerto series in 1991, the two works chosen for the first volume were the piano concertos by Moszkowski and Paderewski. A quarter of a century later, Paderewski’s concerto remains unique to his output—but not Moszkowski’s. No longer can one refer to ‘the Moszkowski concerto’ because in 2008 another, earlier, piano concerto by him was unearthed. That he had written such a work was known to a few, but the score had vanished off the face of the earth. Bojan Assenov, a thirty-something pianist and composer from Berlin, wrote a musicological dissertation on Moritz Moszkowski which included a catalogue of his works. His research led him to the Bibliothèque nationale de France in Paris where he discovered not only the lost concerto and Moszkowski’s diary from those days (the 1870s) but other unpublished works Moszkowski had written during his time as a student at the Neue Akademie der Tonkunst in Berlin. These included a piano quintet, an overture and a symphony in D minor. The scores appear to have been taken by Moszkowski with him to Paris when he moved from Berlin in 1897. On the online piano site Pianophilia, there was a thread about Moszkowski where devotees of the composer tracked down and made available long out-of-print scores. Here, having published his dissertation early in 2009, Assenov posted a link to his thesis. This led to a friend of the pianist Ludmil Angelov visiting the Bibliothèque nationale de France and photographing the entire manuscript of the B minor concerto. Angelov showed the results to the conductor Vladimir Kiradjiev who thought it too good a work to respect the composer’s wish not to publish it. A digital score was created from the manuscript, and was eventually issued by the French publishers Symétrie in 2013. The impetus for the concerto’s creation was to launch the young Moszkowski’s pianistic career. Finishing the work in December 1874 (Tchaikovsky was completing his celebrated B flat minor concerto at exactly the same time), Moszkowski and his friend Philipp Scharwenka (a fellow student and brother of the more famous Xaver) began planning a joint concert of their new works to be performed at the Berliner Singakademie on 13 February 1875. It was nothing if not ambitious, for also on the programme was Moszkowski’s symphony in D minor. The hall was rented and tickets had been sold when the two composers learnt that the great Anton Rubinstein—then second only to Liszt in the musical firmament—would be giving concerts in the Singakademie on 12 and 14 February. After discussions with the conductor for their concert, Ludwig von Brenner, Moszkowski and Scharwenka decided to postpone their concert until 27 March. The following spring, Moszkowski played his new concerto to Liszt in Weimar with gratifying results: ‘He even arranged a small private concert for Madame [Baroness Olga] von Meyendorff in which I played it with him on two pianos.’ Moszkowski dedicated the work to Liszt. There is no record of any further performance until 9 January 2014: 139 years after its premiere, the B minor concerto received its second public hearing when it was presented in the Philharmonie de Varsovie with the present soloist and conductor and the Filharmonia Podkarpacka in Rzeszów. The bound manuscript in Moszkowski’s hand has ‘Op 6’ stamped on the spine. Yet in 1875 his Fantaisie-Impromptu was published with that opus number, and it seems that Moszkowski had designated the concerto as his Op 3. This confusion no doubt contributed to the ‘loss’ of the score. The Bibliothèque nationale de France, too, was unaware of the importance of the archive, acquired sometime in 1961 from, it is thought, Suzanne Redon, art collector and daughter-in-law of the painter Odilon Redon (1840–1916), a friend of the composer. Though written when Moszkowski was still a student, the concerto is way above the normal level of that disparaging category of ‘student work’. It is one of the longest piano concertos composed up to that time (it outlasts even Brahms’s notoriously lengthy Piano Concerto No 2, another four-movement leviathan completed seven years later). The orchestration is supremely accomplished and imaginative; the technically demanding piano-writing has the models of Schumann, Chopin, Liszt and Rubinstein to recommend it; the melodic ideas are fresh and original. It is only the over-long final movement that is not wholly convincing. The concerto is scored for double woodwind (with added piccolo), four horns, two trumpets, three trombones, timpani, triangle and strings. Though all four movements are distinct entities, Moszkowski seems to view them as a seamless succession, ending the first and third on the dominant major (leading naturally into the tonic minor) and asking for the third movement to follow the second without a break. While the opening motif (and the soloist’s echo of it) occurs in different guises throughout the work, the first movement in 3/4 adheres to no traditional sonata form—unlike the third movement and the majority of the fourth. The sinister introduction (109 bars before the piano’s first entry) soon gives way to the genial character that informs most of the concerto. A second distinct subject is presented (at 5'16'') and a third (at 6'58'') until Moszkowski returns to the opening material (8'40'', risoluto e marcatissimo) followed by a passage reminiscent of Chopin’s E minor concerto. The Adagio (in 2/4 time, molto cantabile) has three glorious themes, the second, introduced by the piano, in G major, the third (at 9'16'') in the key of E major—which is also the key of the Scherzo. Its vivacious theme is straight out of a Parisian opéra-comique (Offenbach was then at the height of his power) and has all the hallmarks of the mature Moszkowski familiar from his études and the piano concerto Op 59. After a delicious modulation into E flat major, there is a return to E major before a further switch to B major for the second subject (tranquillo, gracioso e cantabile). A transitional passage returns the music to the tonic minor with an insistent series of solo F sharps from the timpani before the finale. After an introductory twenty bars (Allegro sostenuto) Moszkowski’s finale launches into another of his irresistibly exuberant themes (Allegro con spirito). A second, more relaxed subject (molto espressivo e appassionato) is given out by the clarinets and cellos. The soloist has little respite until the flutes reintroduce the first subject (at 10'49''), at which point the piano is given an unusually lengthy break before returning with the first of two bravura cadenzas. Moszkowski presents a new idea as late as 16'11'', as though he is enjoying himself so much he does not know how or when to stop. But soon afterwards the music settles on B major for the concluding pages which, grandiloquent as they are, summon a surprisingly modest contribution from the piano. Quand Hyperion a lancé la série de concertos romantiques pour piano en 1991, les deux œuvres choisies pour le premier volume étaient les concertos pour piano de Moszkowski et de Paderewski. Un quart de siècle plus tard, le concerto de Paderewski est resté unique en son genre dans l’œuvre de ce dernier—mais pas celui de Moszkowski. On ne peut plus parler «du concerto de Moszkowski» car, en 2008, on a découvert un autre concerto pour piano antérieur dont il est l’auteur. Quelques personnes savaient qu’il avait écrit une telle œuvre, mais la partition avait disparu sans laisser de traces. Bojan Assenov, pianiste et compositeur berlinois d’une trentaine d’années, a écrit une thèse musicologique sur Moritz Moszkowski qui comprenait un catalogue de ses œuvres. Ses recherches l’ont conduit à la Bibliothèque nationale de France à Paris, où il a découvert non seulement le concerto perdu et le journal de Moszkowski de cette époque (les années 1870), mais d’autres œuvres inédites que Moszkowski avait écrites pendant la période où il était étudiant à la Neue Akademie der Tonkunst de Berlin. Parmi ces œuvres figuraient un quintette avec piano, une ouverture et une symphonie en ré mineur. Les partitions semblent avoir été emportées à Paris par Moszkowski quand il quitta Berlin en 1897. Sur le site pianistique en ligne Pianophilia, il y avait une page consacrée à Moszkowski où des admirateurs du compositeur avaient retrouvé et rendu accessibles des partitions épuisées depuis longtemps. Ayant publié sa thèse au début de l’année 2009, Assenov y créa un lien vers celle-ci, ce qui amena un ami du pianiste Ludmil Angelov à se rendre à la Bibliothèque nationale de France pour y photographier tout le manuscrit du Concerto en si mineur. Angelov montra les résultats au chef d’orchestre Vladimir Kiradjiev qui considéra que l’œuvre était trop bonne pour respecter le souhait du compositeur de ne pas la publier. Une partition numérique fut réalisée à partir du manuscrit et finalement publiée par l’éditeur français Symétrie en 2013. L’impulsion pour la création du concerto devait lancer la carrière pianistique de Moszkowski. Il acheva cette œuvre en décembre 1874 (Tchaïkovski terminait son célèbre concerto en si bémol mineur exactement au même moment) et avec son ami Philipp Scharwenka (étudiant comme lui et frère du plus célèbre Xaver) il commença à préparer un concert commun de leurs nouvelles œuvres à la Berliner Singakademie le 13 février 1875. C’était assez ambitieux, car au programme de ce concert figurait aussi la symphonie en ré mineur de Moszkowski. La salle était louée et les billets vendus lorsque les deux compositeurs apprirent que le grand Anton Rubinstein—qui venait alors juste après Liszt au firmament musical—donnerait des concerts à la Singakademie les 12 et 14 février. Après en avoir discuté avec le chef d’orchestre Ludwig von Brenner qui devait diriger leur concert, Moszkowski et Scharwenka décidèrent de le retarder jusqu’au 27 mars. Au printemps suivant, Moszkowski joua son nouveau concerto à Liszt, à Weimar; les résultats furent flatteurs: «Il a même arrangé un petit concert privé pour Madame [la baronne Olga] von Meyendorff où je l’ai joué avec lui à deux pianos.» Moszkowski dédia cette œuvre à Liszt. Il n’y a aucune trace d’une autre exécution jusqu’au 9 janvier 2014: 139 ans après sa création, le Concerto en si mineur reçut sa seconde écoute publique lorsqu’il fut présenté à la Philharmonie de Varsovie avec le présent soliste, le présent chef d’orchestre et le Filharmonia Podkarpacka de Rzeszów. Le manuscrit relié de la main de Moszkowski comporte la mention «op.6» tamponnée au dos. Le compositeur semble être revenu sur cette numérotation car en 1875 sa Fantaisie-Impromptu fut publiée sous ce numéro d’opus, et il semble que Moszkowski ait désigné le concerto comme son op.3. Cette confusion contribua sans doute à la «perte» de la partition. En outre, la Bibliothèque nationale de France n’avait pas conscience de l’importance de ces archives, achetées en 1961, pense-t-on, à Suzanne Redon, collectionneuse d’œuvres d’art et belle-fille du peintre Odilon Redon (1840–1916), un ami du compositeur. Même s’il l’écrivit au cours de ses études, ce concerto est bien meilleur que cette catégorie assez dépréciée d’«œuvres d’études». C’est l’un des plus longs concertos pour piano composés jusqu’alors (il dure même plus longtemps que le Concerto pour piano nº 2 de Brahms notoirement long, autre Léviathan en quatre mouvements achevé sept ans plus tard). L’orchestration est absolument accomplie et imaginative; l’écriture pianistique très exigeante sur le plan technique prend pour modèles Schumann, Chopin, Liszt et Rubinstein; les idées mélodiques sont nouvelles et originales. Seul le finale trop long n’est pas totalement convaincant. Ce concerto est écrit pour bois par deux (avec un piccolo en plus), quatre cors, deux trompettes, trois trombones, timbales, triangle et cordes. Si les quatre mouvements sont des entités distinctes, Moszkowski semble les considérer comme une succession ininterrompue, terminant le premier et le troisième sur la dominante majeure (menant naturellement à la tonique mineure) et demandant que le troisième mouvement s’enchaîne au deuxième sans interruption. Si le motif initial (et l’écho qu’en donne le soliste) apparaît sous différentes formes du début à la fin de l’œuvre, le première mouvement à 3/4 n’observe aucune forme sonate traditionnelle—contrairement au troisième mouvement et à la majeure partie du quatrième. La sinistre introduction (109 mesures avant la première entrée du piano) fait bientôt place au caractère chaleureux qui domine dans la majeure partie du concerto. Un deuxième sujet distinct est présenté (à 5'16'') puis un troisième (à 6'58'') jusqu’à ce que Moszkowski revienne au matériel initial (8'40'', risoluto e marcatissimo) suivi d’un passage évoquant le Concerto en mi mineur de Chopin. L’Adagio (à 2/4, molto cantabile) comporte trois magnifiques thèmes, dont le deuxième est introduit par le piano, en sol majeur et le troisième (à 9'16'') dans la tonalité de mi majeur—qui est aussi la tonalité du Scherzo. Son thème plein de vivacité semble sortir tout droit d’un opéra-comique parisien (Offenbach était alors à l’apogée de son talent) et présente toutes les caractéristiques de Moszkowski dans sa maturité que l’on trouve dans ses études et son Concerto pour piano, op.59. Après une délicieuse modulation en mi bémol majeur, il y a un retour à mi majeur avant un autre passage en si majeur pour le deuxième sujet (tranquillo, gracioso e cantabile). Une transition ramène la musique à la tonique mineure avec une série insistante de fa dièse solos des timbales avant le finale. Après vingt mesures d’introduction (Allegro sostenuto), Moszkowski se lance dans un autre de ses thèmes à l’exubérance irrésistible (Allegro con spirito). Un deuxième sujet plus détendu (molto espressivo e appassionato) est exposé par les clarinettes et les violoncelles. Le soliste a peu de répit jusqu’à ce que les flûtes réintroduisent le premier sujet (à 10'49''); à ce point, le piano se voit accorder une pause d’une durée exceptionnelle avant de revenir avec la première des deux cadences de bravoure. Moszkowski présente encore une nouvelle idée à 16'11'', comme s’il s’amusait tellement qu’il ne savait ni comment ni quand s’arrêter. Mais, peu après, la musique s’installe en si majeur pour les dernières pages qui, aussi grandiloquentes soient-elles, requièrent une contribution étonnamment modeste du piano. Als Hyperion 1991 seine Reihe Romantic Piano Concerto ins Leben rief, wählte man als erste Aufnahme die Klavierkonzerte von Moszkowski und Paderewski. Ein Vierteljahrhundert später bleibt es der einzige Beitrag von Paderewski, nicht jedoch der von Moszkowski. Nun kann man also nicht mehr vom „Moszkowski-Konzert“ sprechen; denn 2008 wurde ein weiteres, früheres Klavierkonzert von ihm entdeckt. Zwar wussten einige Wenige, dass er ein solches Werk geschrieben hatte; aber die Noten waren wie vom Erdboden verschluckt. Bojan Assenov, ein circa dreißigjähriger Pianist und Komponist aus Berlin, hatte eine musikwissenschaftliche Dissertation über Moszkowski geschrieben, die auch ein Werkverzeichnis enthielt. Seine Forschungsarbeiten führten ihn u.a. nach Paris in die französische Nationalbibliothek, wo er nicht nur das verschollene Konzert und das Tagebuch Moszkowskis aus der Zeit um 1870 entdeckte, sondern auch weitere unveröffentlichte Werke, die dieser während seines Aufenthalts als Student an der Neuen Akademie der Tonkunst in Berlin komponiert hatte. Die Partituren, darunter ein Klavierquintett, eine Ouvertüre und eine Symphonie in d-Moll scheint Moszkowski mitgenommen zu haben, als er 1897 von Berlin nach Paris übersiedelte. Auf der Klavier-Website Pianophilia befand sich ein Moszkowski-Thread, wo Fans dieses Komponisten Stücke ausgegraben und zugänglich gemacht hatten, die schon längst nicht mehr im Handel waren. Hier setzte Assenov einen Link zu seiner Dissertation, die er Anfang 2009 veröffentlicht hatte. Das wiederum veranlasste einen Freund des Pianisten Ludmil Angelov, die französische Nationalbibliothek aufzusuchen und das gesamte Manuskript des h-Moll-Konzerts fotografisch festzuhalten. Daraufhin zeigte Angelov das Ergebnis dem Dirigenten Vladimir Kiradjiev, der der Meinung war, dass das Werk zu gut sei, um dem Wunsch des Komponisten nachzukommen, es nicht zu veröffentlichen. So wurde nach dem Manuskript eine Partitur angefertigt und schließlich vom französischen Verleger Symétrie 2013 gedruckt. Der Anstoß zur Komposition dieses Konzerts ist sicher darin zu sehen, dass die pianistische Karriere des jungen Moszkowski vorangetrieben werden sollte. Nachdem das Werk im Dezember 1874 fertiggestellt war (genau zur gleichen Zeit vollendete auch Tschaikowsky sein berühmtes b-Moll-Konzert), begannen Moszkowski und sein Freund Philipp Scharwenka (ein Kommilitone und der Bruder des berühmteren Xaver) mit der Planung einer gemeinsamen Aufführung ihrer neuen Werke in der Berliner Singakademie am 13. Februar 1875. Das war ein absolut ehrgeiziges Unterfangen; denn auf dem Programm stand auch Moszkowskis Symphonie in d-Moll. Der Saal war schon gemietet und die Tickets verkauft, als die beiden Komponisten erfuhren, dass der große Anton Rubinstein—nach Liszt der alleinige Zweite am musikalischen Firmament—am 12. und 14. Februar in der Singakademie auftreten würde. So beschlossen Moszkowski und Scharwenka nach einer Rücksprache mit dem Dirigenten ihres Konzerts, Ludwig von Brenner, die Veranstaltung auf den 27. März zu verlegen. Im folgenden Frühjahr spielte Moszkowski in Weimar mit erfreulichem Erfolg sein neues Konzert Liszt vor: „Er arrangierte sogar ein kleines Privat-Concert bei Fr. v. Meyendorff, in welchem ich es auf zwei Clavieren mit ihm spielte.“ Moszkowski widmete das Werk Liszt. Es gibt keinen Hinweis auf irgendeine weitere Aufführung bis zum 9. Januar 2014. Erst 139 Jahre nach seiner Uraufführung erklang das h-Moll-Konzert zum zweiten Mal vor einem Publikum, und zwar in einem Konzert in der Philharmonie Warschau mit dem Solisten und Dirigenten der vorliegenden CD und der Filharmonia Podkarpacka Rzeszów. Das gebundene Manuskript mit der Handschrift Moszkowskis hat auf dem Buchrücken „Op. 6“ eingeprägt. 1875 jedoch erschien als op. 6 sein Fantaisie-Impromptu. Er hat also wohl für das Konzert die Opusnummer 3 vorgesehen. Diese Unklarheit trug zweifellos auch zum „Verschwinden“ des Konzertes bei. Die französische Nationalbibliothek war sich ebenfalls nicht der Bedeutung der Sammlung bewusst, die sie irgendwann im Jahre 1961 wohl von Suzanne Redon, Kunstsammlerin und Schwiegertochter des Malers Odilon Redon (1840–1916), einem Freund des Komponisten, erworben hatte. Auch wenn das Konzert bereits entstand, als Moszkowski noch Student war, übertrifft es doch weit das Niveau, das man üblicherweise abschätzig in die Kategorie „Schülerarbeit“ einordnet. Es ist eines der längsten Klavierkonzerte, die bis dahin geschrieben wurden (es dauert sogar länger als das berüchtigt lange 2. Klavierkonzert von Brahms, ein weiterer viersätziger Gigant, sieben Jahre später vollendet). Die Orchestrierung ist in höchstem Maß gelungen und fantasievoll; der technisch anspruchsvolle Klaviersatz gewinnt Attraktivität durch Elemente von Schumann, Chopin, Liszt, und die Melodik ist von origineller Frische. Lediglich der überlange Schlusssatz kann nicht ganz überzeugen. Das Konzert ist gesetzt für doppelt besetzte Holzbläser (mit Piccolo), 4 Hörner, 2 Trompeten, 3 Posaunen, Pauken, Triangel und Streicher. Obwohl alle vier Sätze in sich geschlossen sind, scheint Moszkowski sie als nahtlose Abfolge angesehen zu haben; denn er beendet den ersten und dritten Satz auf der Dur-Dominante (die dann logischerweise zur Moll-Tonika führt), und schreibt vor, dass der dritte Satz ohne Unterbrechung auf den zweiten folgen soll. Während das einleitende Motiv (und die Antwort des Solisten darauf) in verschiedenen Abwandlungen im Werk immer wieder auftaucht, folgt der erste Satz im Dreivierteltakt im Gegensatz zum dritten und dem größten Teil des vierten keiner traditionellen Sonatenform. Die düstere Einleitung (109 Takte bis zum ersten Einsatz des Klaviers) weicht bald der freundlichen Stimmung, die den größten Teil des Werkes bestimmt. Ein zweites kontrastierendes Thema wird bei 5'16'' vorgestellt, ein drittes bei 6'58''. Dann kehrt Moszkowski wieder zum Ausgangsmaterial zurück (8'40'' risoluto e marcatissimo), gefolgt von einer Passage, die an Chopins e-Moll-Konzert erinnert. Das Adagio (im Zweivierteltakt molto cantabile) enthält drei wunderbare Themen; das zweite in G-Dur wird vom Klavier vorgestellt, das dritte (bei 9'16'') steht in E-Dur, der Tonart des folgenden Scherzos. Sein temperamentvolles Thema scheint direkt der Pariser Opéra-comique entsprungen zu sein (Offenbach war damals auf der Höhe seines Schaffens) und hat schon alle Kennzeichen des reifen Moszkowski, wie wir sie aus seinen Etüden und dem Klavierkonzert op. 59 kennen. Nach einer raffinierten Modulation nach Es-Dur und einer Rückkehr nach E-Dur wechselt das Stück für das zweite Thema nach H-Dur (tranquillo, gracioso e cantabile). Eine Überleitung bringt die Musik zurück zur Moll-Tonika mit einer eindringlichen Folge von Solo-Fis’s in der Pauke, die das Finale ankündigen. Nach einer 20-taktigen Einleitung (Allegro sostenuto) startet Moszkowski wieder einmal eines seiner unwiderstehlich überschäumenden Themen (Allegro con spirito). Es folgt ein zweites, etwas entspannteres Thema (molto espressivo e appassionato), gespielt von Klarinetten und Celli. Der Solist hat nun kaum eine Atempause, bis die Flöten das erste Thema wieder aufnehmen (10'49''). Hier hat das Klavier eine ungewöhnliche lange Pause und kehrt dann mit der ersten von zwei Bravur-Kadenzen wieder zurück. Erst bei 16'11'' präsentiert Moszkowski noch einen weiteren Einfall, als ob er eine Riesenfreude daran habe, nicht zu wissen, wie oder wann er aufhören solle. Aber kurz danach beruhigt sich die Musik für die abschließenden Seiten nach H-Dur, die trotz aller pathetischen Wucht dem Klavier nur einen überraschend bescheidenen Beitrag abverlangen.